JUST THREE YEARS after uprooting to Australia, Anna Grant was moving home to Dublin to establish a business with her in-laws. The pair both got decent jobs, however after a while Eamonn started feeling the pull home. His mother, Mary, had run a small flower supply business from her home since the 90s. Things were starting to take off and his father, Michael, had to help out. Eamonn liked the idea of moving home to make a serious go of the business with his parents. Anna decided to go along for the ride. “Of course I had (misgivings), it would’ve been strange for me not to,” she tells Fora. “I was leaving Australia and my friends, but it was with Eamonn. I was planning to start a life with him and that was part of his character. The two took a long trip back from Australia. In Italy, Eamonn proposed and Anna said yes. By 2006, the pair were back in Ireland and Anna later became Anna Grant. The two husband-and-wife teams all had different areas to specialise in, with Grant focusing on marketing and logistics. The Dubliner had worked in public relations since leaving college in 2001, and set about trying to get attention for the new company, Flowers Made Easy. “Michael managed the finance, Eamonn was on the tech and business development side of things and Mary has 30 years expertise in the flower business,” she says. The business grew quickly in its early days and soon moved out of Mary’s house and into an industrial unit in Sandyford. It started off as an online portal for people to buy flowers: customers would shop on the website and have their flowers delivered. When things started to take off, however, the company moved into wholesale. Grant says that big flower suppliers in countries like the Netherlands will only deal with businesses that buy big and often. When Flowers Made Easy became more trusted, the company looked at ways of branching out. The Dublin firm started allowing other businesses, such as florists, to buy wholesale deliveries through its website. Flowers Made Easy either bought the flowers in itself and sold them onto other businesses, or got a cut of the sales when it enabled companies to buy direct from its suppliers. Even though the firm had to weather the recession, it managed to expand slowly during the lean years and grew to employ about 10 people, including family members. Anna and Eamonn had their first child in 2011. Soon after, Eamonn left the business to work as head of online for AA Roadwatch. Asked if it was hard on her when Eamonn left the business, Grant says: “No, the timing was good and I think it helped me and Mary, it made us tighter. The business has continued to grow, with Grant and Mary now handling most of the day-to-day operations. It currently employs about 15 staff including full and part-time workers and has annual sales of around €1 million. Flowers Made Easy has several different operations. The main one is its online portal, through which average punters buy flowers and bouquets for themselves or as gifts. The wholesale trade is the other main arm of the business, however the company also does wedding flowers and holds classes for people who are looking to retrain and get involved in the botanical industry. It recently opened a retail outlet in Foxrock. “We have our supplier in Holland. We buy in flowers and do deliveries, we have our own drivers who deliver to the whole of the Dublin area,” Grant says. “If it’s outside of that then we send it by courier and make sure that the customer has it the next day. The vast majority of the company’s business is in Ireland. While it makes some sales abroad, they are mostly for products such as materials used to build a bouquet. “We use a network of florists internationally to fulfill orders abroad,” Grant says. “We deliver to Dingle, the Skellig islands, anywhere. Being able to deliver throughout the country by the next day has been invaluable. Although it acts as a supplier for many of them, florists are also the company’s greatest competition. The company is now looking to become more unified in the new year: Grant wants it to become known for some of the other services it offers, such as wedding flowers, as well as its online deliveries. Despite her husband moving on years ago, Grant has no intention of leaving the business. “I’m happy with what I’m doing, it’s about growing the business and it’s what keeps me happy,” she says. “Some day in the future I look forward to continuing the brand. Mary and Michael will always be there as a support network, even if they’re not there as much day-to-day eventually. 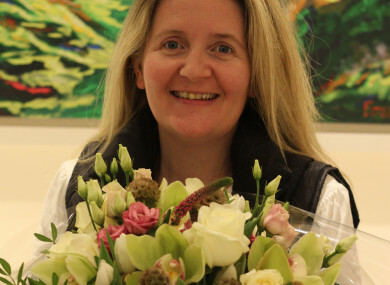 Email “Why this Dublin woman left Melbourne to start a flower business with her in-laws”. Feedback on “Why this Dublin woman left Melbourne to start a flower business with her in-laws”.